The implant recipient site is wide buccopalatally. 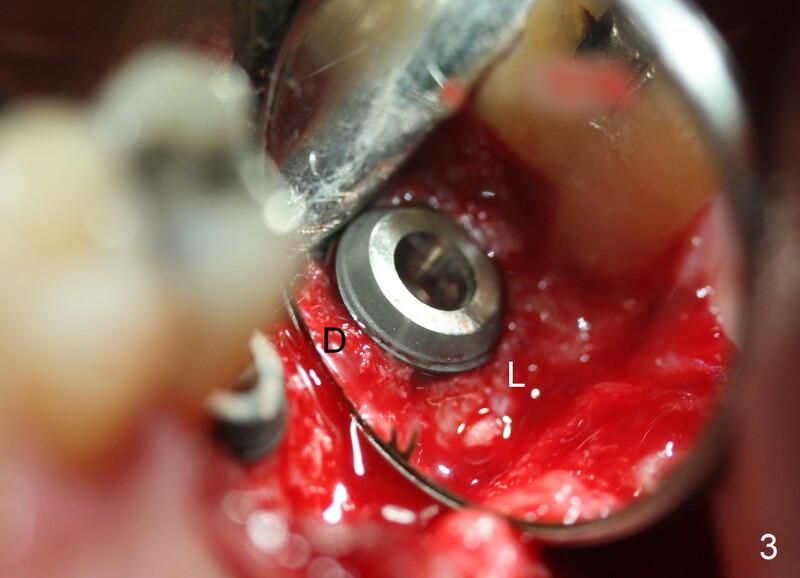 After incision, a 3.9/4.7 mm trephine bur (from UF Extra Wide Implant kit) is used to initiate osteotomy 2.5 mm from the distal surface of the tooth #13. The depth of the trephine bur is 2 mm. The block of bone is difficult to be removed from the osteotomy. It is pushed into the sinus with a 3.5 mm osteotome with minor membrane perforation. The perforation is getting worse when allograft and Osteogen is being pushed upward. It is repaired with insertion of Osteotape and more durable collagen membrane, followed by bone graft. The osteotomy opening is enlarged slightly with a 6x6 mm tapered drill, followed by insertion of a 6.5 mm tap. 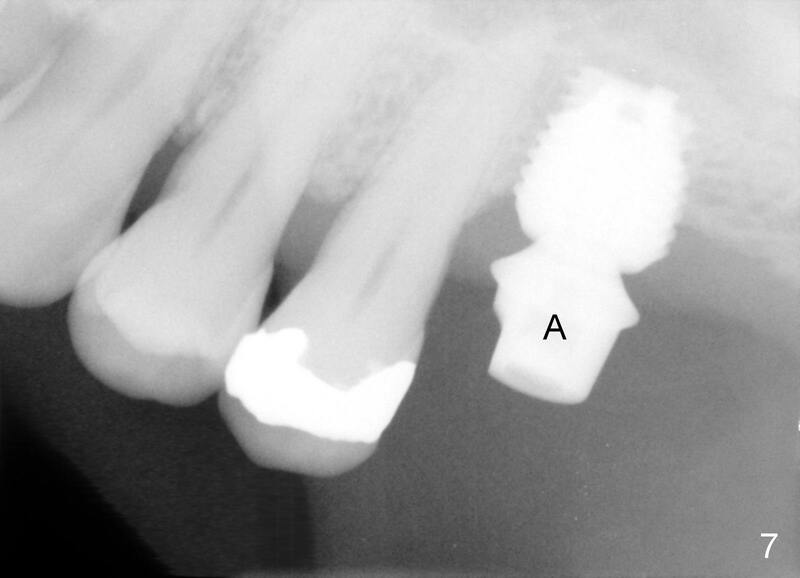 When a 7x6 mm bone-level implant is placed with >60 Ncm, the axis is not parallel to that of the neighboring teeth. The implant is backed up and re-directed. The trajectory is changed within normal limit (Fig.2); the torque is slightly less than before. The distal 2nd thread is outside the crestal bone (Fig.2 <). 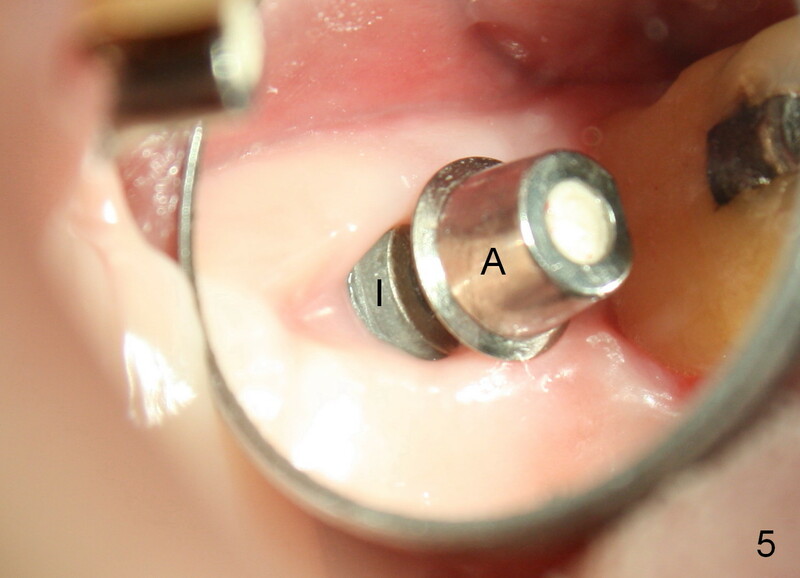 The implant is placed deeper so that the distal 2nd thread is almost subcrestal (Fig.3). The remaining threads are covered by bone graft, followed by collagen membrane. There is tension to close the wound. A cemented abutment is placed (6.8x4(2) mm) to hold perio dressing in place. Postop instruction is given, including sinus precaution. Afrin is prescribed. The patient continues using Amoxicillin and Chlorhexidine postop. Surprisingly, there is no sinus symptom postop. 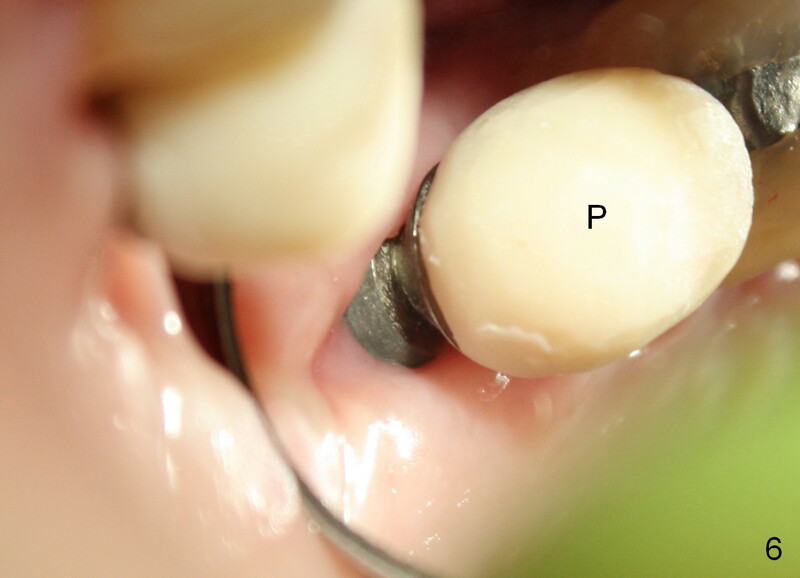 The perio dressing remains in place 1 week postop (Fig.4). Later on, mild infection develops around the implant orally. One week of Amoxicillin is prescribed. The symptom improves. 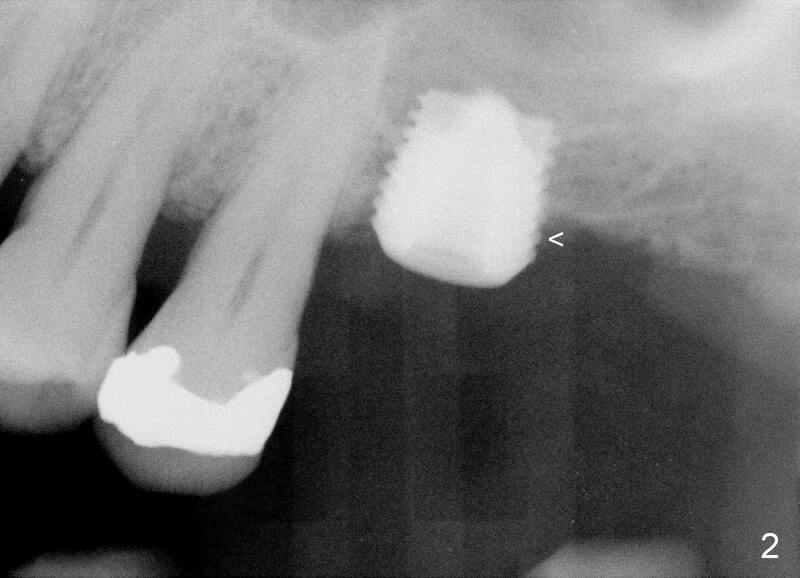 One month postop, the patient returns for follow up: the distal implant plateau is exposed (Fig.5 I). A provisional is fabricated for protection of the wound and comfort (Fig.6 P). The exposed plateau should be able to be covered by the gingiva in a few months. 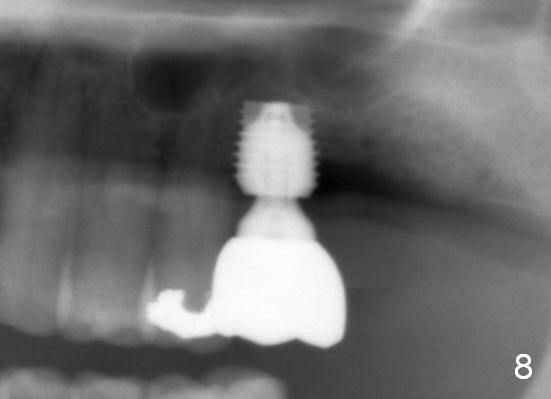 In contrast, the UF extra wide implant may not be the best candidate for the mandibular immediate implant. 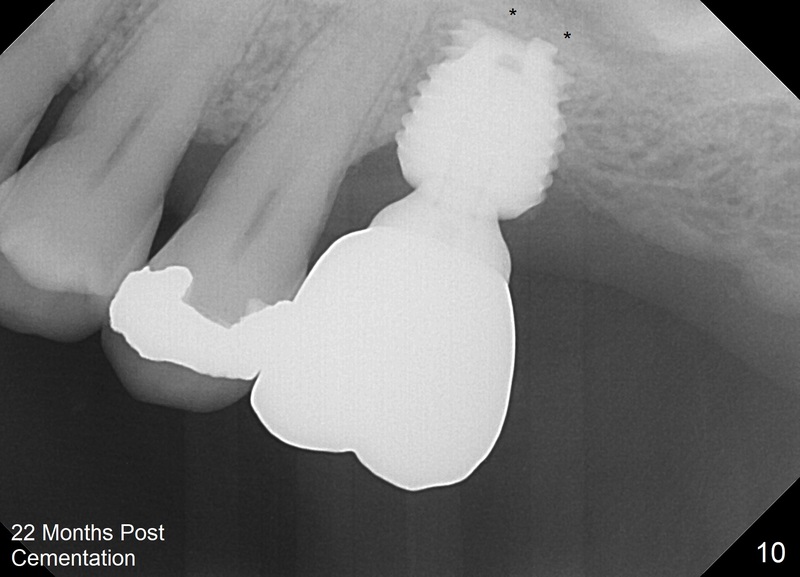 When the patient returns for impression 6.5 months postop, the provisional has dislodged because of the short abutment (Fig.7 A (6.5x4(2) mm). A longer one is placed (6.5x5(3) mm). When he returns for crown cementation 8.5 months postop, the provisional is retentive. The distal implant plateau is still exposed. Post-cementation panoramus shows that the distal 3 threads are not covered by the bone and that the crown/implant ratio is 5:3 (Fig.8). Implants are recommended at #3 and 30 (Fig.9). 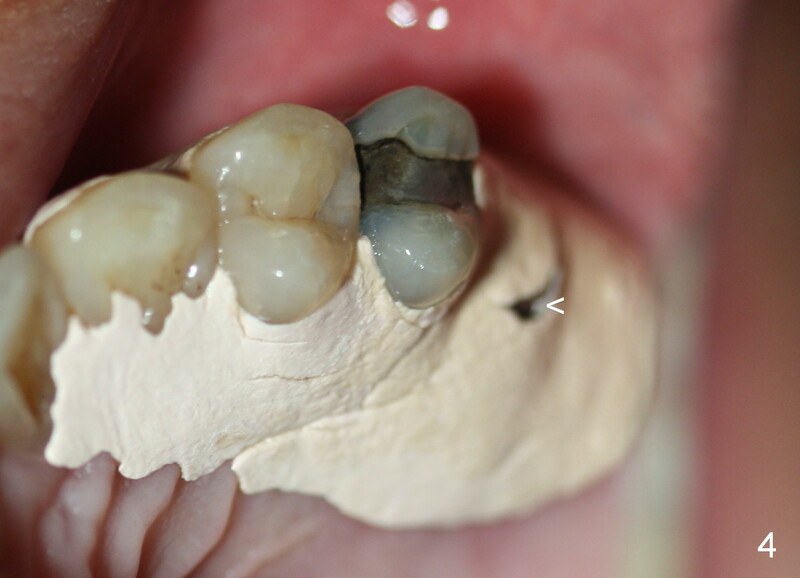 There is a distinct layer of bone apical to the implant at #14 22 months post cementation (Fig.10 *). 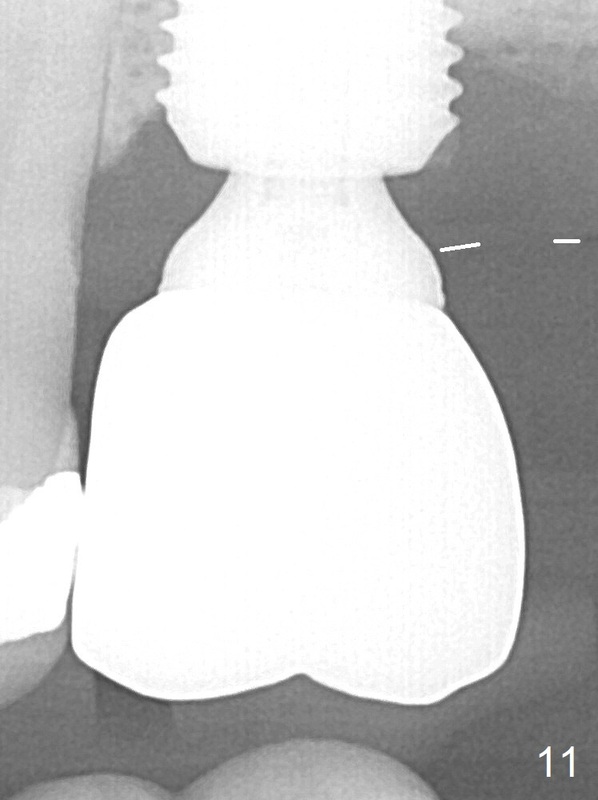 In spite of exposure of 2-3 threads distally, there is no sign of peri-implantitis. 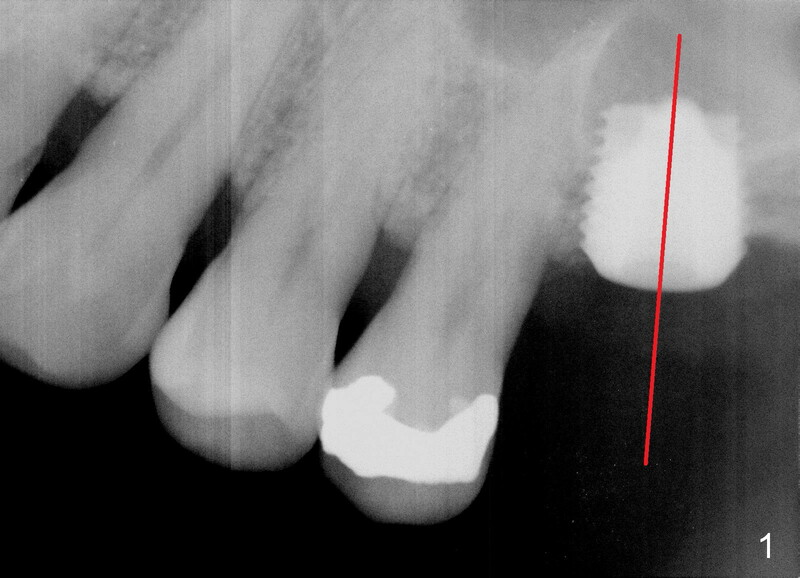 It appears that the implant is subgingival (Fig.11 (BW) white dashed line: gingival margin).